Why do trains have locomotives at the rear end ? So today, we are talking about trains. Isn’t it fascinating to watch a single locomotive pulling dozens of wagons at such incredible speed! I remember when I was a kid, I used to sit on the railway platforms waiting for a fast train to pass by & enjoy the loud sounds of locomotives & gust of wind. Ah, those were the days! Anyway, let’s know why do some trains have multiple engines or to be precise why trains have locomotives at the rear end, because that’s what you came here for. Well, answering the first question is simple. If the train carries more load, a second locomotive is attached. But does it really matter if it is attached to front or rear part? Such a system where a second or other multiple prime movers are coupled at the rear end and/or distributed along the whole train is called distributed power systems. All the commuter, metro & modern electric trains are a great example of DP systems where motors are located on both the ends as well as at the centre of trains. Extra power and locomotives are needed generally for freight trains due to heavy load and seldom for passenger trains. But the question springs up again, why rear end? Well, there are number of reasons for this and let’s get to them. Imagine a case where a freight train runs up a slope. Very high torque is needed to move the whole train because of slope & heavy load. This high torque can result into the front part of locomotive to pivot around rear wheels. The best example you could imagine is lift of the front part of a muscle car or a rider doing a wheelie when one suddenly accelerates(high torque). In case of trains, the engine won’t lift and lose contact with the rails since it’s so heavy but surely it would reduce the normal reaction which results in lower friction. And low friction leads to low power delivery. An illustration depicting the problem of pivoting. Consider another case where a locomotive is attached to the last wagon. The problem of pivoting is eliminated significantly since the rear engine is already pushing the cars forward. Along with that, the vertical component of the weight of all the wagons holds down the front part of rear engine developing more friction. Note that the problem of pivoting would reduce but still exist if both engines were located in the front. The engine & wagons are coupled by a combination of hook & knuckle joint(India). 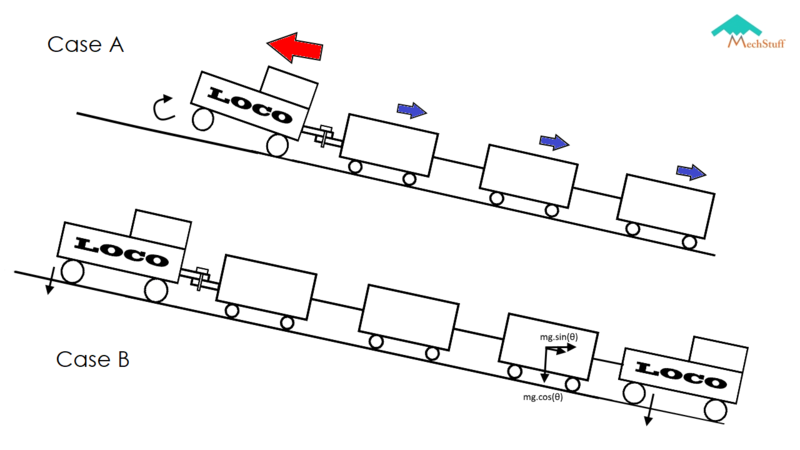 If the locomotive pulls the whole train on an up slope, the joint on the head end has to take all the load. This makes the joint vulnerable to drawbar & knuckle pin failures. The attachment of rear engine reduces the chances of failure since it pushes the whole train and reduces the stress. 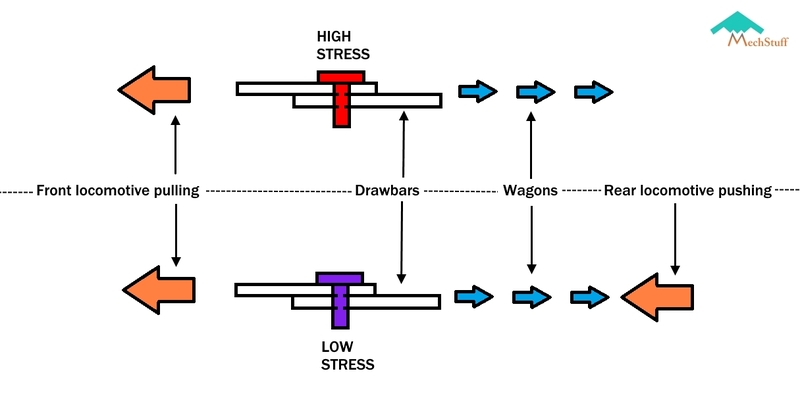 Here’s a drawing explaining how the rear locomotive helps in reducing amount of stress. Also while descending, the joint on the tail end carries the all load. This way the location of heavy load region keeps on alternating and ensures that not only one part is subjected to high stresses & thereby reduces number of part failures. The rear & front, both the parts of the train would be in control if the rear end was attached with a locomotive instead of the front end. So this is one of the many advantages of connecting the engine to rear end – Safety! Now this… kind of blew my mind. When a train stops at a station, all the slack between the couplings is taken out & the tension between the drawbars of the wagons stay as it is. This means that if the engine starts moving forward, it will have to move the entire train at once. This is similar to a scenario where one tries to expand an already expanded spring. It will take a tremendous amount of power and force to overcome friction and inertia of the whole train at once. So the trick here is that the rear locomotive pushes all the wagons from behind in order to compress all the couplings and letting them slack. Now when the engine starts moving forward carrying the load of one wagon at a time. This method enables the train to consume less energy/fuel to set itself in motion. In passenger trains or trains consisting only 1 locomotive at the front, this is done by reversing the direction of the power. You need multiple engines in the front and rear end for fully loaded freight trains but you don’t need multiple loco pilots. All the locomotives can be controlled by the loco pilot/engineer sitting in the frontmost cabin !